Looking to make a name for themselves on the national circuit, the newfound MSU Paintball Club has been resurrected after nine years of inactivity. Coming together in the fall, a group of friends hoped to expand the sport of paintball at MSU. 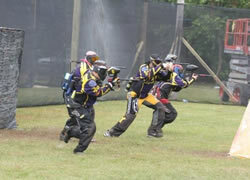 With the intent of heading to local paintball fields for some fun on the weekend, the club has now entered a number of tournaments held by the National Collegiate Paintball Association and are currently gearing up for the national championships from April 17 to 19. Supply chain management freshman Joe Lynch explains that the club is multi-dimensional, encouraging anyone to give the sport a try. Seen as a chaotic sport that can be played with friends in the back woods, collegiate paintball is actually driven by strict formation and strategy. Players use terms such as “Dorito” and “snake” to describe the design of the air bunkers on opposing sides. Fully backed by the professional team Detroit Action, MSU Paintball Club is allowed to use both their indoor and outdoor practice fields, and they only have to pay for cases of paint. Even though the group is newly formed, that doesn’t correlate to inexperience on the team. Kinesiology junior Danielle Rosebrook has been playing paintball since she was 10 years old, and has even played for the Detroit Action’s second line. But practice can only go so far. The team has been able to play a number of collegiate teams and has even played a professional team. When practicing in Fort Wayne, Indiana, club ran into a new team merging onto the professional circuit.